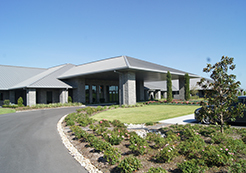 Dril-Quip, Inc. World Headquarters includes administrative, sales, engineering, research and development, forge, heat treat and manufacturing facilities on a 218-acre campus site on Eldridge Parkway in northwest Houston. On-site are 16 major buildings totaling 1,620,900 square feet of space divided into 1,323,700 square feet of shop and warehouse facilities and 297,200 square feet of office space. An additional 600,000 square feet of outdoor staging, storage and shipping area is used to hold product for the next step in the manufacturing process, for crating and transporting off campus or to store customers’ material. The Dril-Quip World Headquarters Administration building houses the administrative, finance, sales, engineering and information technology departments of the company, with sales emphasis on operations in the Western Hemisphere. Each department is housed in a separate wing of the building. All engineers have separate, private offices and the designers and draftsmen are located in close proximity to these offices. The majority of draftsmen are placed in one location to allow for easy transfer of electronic records among the various CAD workstations. The Forge/Heat-Treat Building consists of 234,517 square feet of shop space and 21,579 square feet of office space. The Forge Bay currently houses nine furnaces with the capacity to heat up to 100,000 lbs of steel to a maximum temperature of 2,400 degrees Fahrenheit. 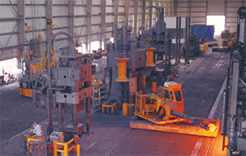 There are five presses and two ring mills in operation in the Forge Bay. IIn the Heat-Treat Bay there are 20 furnaces with 2,000˚Fahrenheit maximum temperature range, and four quench tanks, each with approximately 30,000 gallons of quench medium (water and light/heavy polymer) that are used for normalizing / quenching / tempering heat treatment forgings. The Rough Machine Shop, 84,200 square feet in area, contains manually controlled turret lathes, vertical turret lathes and milling machines. The shop has the capability of rough machining forgings prior to any heat-treating, final machining, and cladding. 6,400 square feet of office and material test laboratory space are included within the Rough Machine Building. The material test laboratory contains a Charpy V notch machine and a tensile test machine, all to ensure materials are built to API and Lloyd’s specifications. The Finish Machine Building is the largest building of Dril-Quip’s manufacturing facilities, with 393,119 square feet of shop space and 48,900 square feet of office space. The shop contains the majority of CNC machines (programmed in-house) used at the Eldridge facility, and additional manual machines. The majority of Dril-Quip products are capable of being machined in this shop. The 56,500 square feet of floor space that comprises the main Assembly Test Shop is used to assemble numerous products of Dril-Quip such as Xmas trees, tree frames, Lower Riser Packages, Emergency Release Packages, test bases, test stands, transportation skids, and more. Two test pits in the shop floor are used to connect system components together and to conduct Factory Acceptance Tests of complete subsea systems. 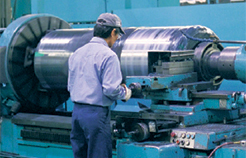 Dril-Quip’s Fabrication facilities are composed of three separate buildings. A 57,900-square-foot General Fabrication Shop provides a full line of fabrication using the latest technology. In the 21,340-square-foot Heavy Fabrication Shop, various steel structures such as manifolds and templates are built. Finally, a 32,360-square-foot Pipe Fabrication Shop exists to handle a wide range of steel pipes, pipe fittings and tubulars. 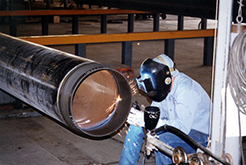 State-of-the-art tubular welding shops are located within all three fabrication shops. Marine Riser Building: A separate building is dedicated solely to producing marine riser systems. Riser systems up to 42 inches in diameter and 175 feet in length can be fabricated. Subsea Control Systems Building: A building dedicated exclusively to the Subsea Control Systems product line. Liner Hanger Building: The Liner Hanger building supports the engineering, assembly and warehousing of Dril-Quip's Downhole Tools product line. Research and Development Building: The Research and Development facility was constructed by industry request to house test fixtures that provide the most stringent and exacting testing methods for Dril-Quip components. Pipe Fabrication Building: This 32,360-square-foot building houses the casing fabrication process where Dril-Quip Specialty Casing Connectors are precision welded to the ends of bare pipe. 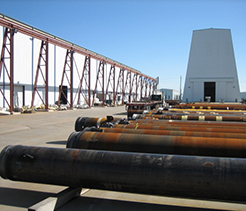 The building has two parallel production lines, capable of processing 20” through 36” size casing through the positioning, welding, post-weld stress relief (when required), radiographic inspection of the joints and part marking as each section of pipe rolls through the facility.